If you like Japanese import video games, I enthusiastically recommend Atelier Escha & Logy: Alchemists of the Dusk Sky . The premise of the game is that you’re an alchemist who uses your alchemical powers to craft weapons and armor to fight monsters, who conveniently drop more recipes to craft and items to craft them with. 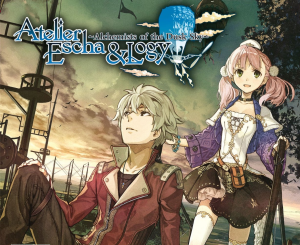 Although the Atelier series, of which this game is the fifteenth installment, has received justifiable criticism for the similarity of its entries, Atelier Escha & Logy still has new characters embellishments to the core mechanics that are compelling enough to prevent the game from becoming stale. Of particular note is its introduction of establishing consumable items as equipment, causing them to be refreshed automatically upon returning from the field to town. One of the weak points in the Atelier series has been the micromanagement involved in maintaining the combat readiness of the party (especially given that it’s often superfluous, given the low difficulty curve of most of its games); this new mechanic reduces the amount of time spent on such minutiae. Having played the three prior games, I nevertheless encountered enough surprises in the game, ranging from its setting to some of the details of the item-crafting process, to sustain my interest throughout its 30+ hours of play. Atelier Escha & Logy is an engrossing game that provides a welcome departure from more formulaic and shallow RPGs. Atelier Escha & Logy was released in the US on March 11. Import versions from Japan are also currently available.